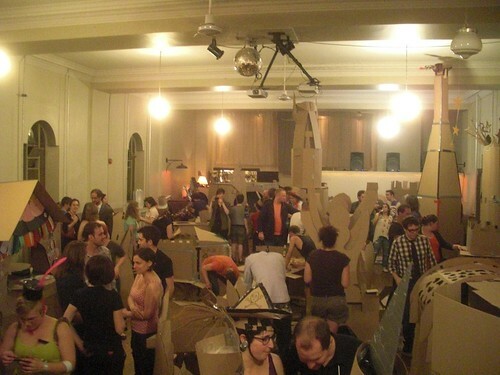 The Toronto Awesome Foundation grant for the Month of April was Cardboard Fort Night, and the event was last weekend. It was a huge success! I had sooo much fun building cardboard forts, and so did all of my friends and at least 150 other people. We packed that place, and the creativity on display was stunning. In particular I vividly recall the boat, the super tall ray gun, the life-sized TV, the candy bar, the super mario castle, the dinosaur, the kiss hut, the eye of sauron, and of course the cardboard tank that I helped to build (including turret hats!). For once I actually managed to take enough photos to satisfy myself as well: complete flickr set, some of them are a little but blurry, but I think it captures the build out very nicely! I awarded Sherwin (the organizer and winner of the Awesome award) his $1 "Lifetime Awesome Achievement Award", the first annual such award, given to the him because he ALONE was responsible for 30% of the submissions to the Toronto Awesome Foundation for the month of April. The man is a machine! We need more awesome people like him. Submit your idea now for the month of July!